Now that more brands and companies are writing blogs, creating YouTube channels, and becoming content publishers, there’s a higher demand for content and limited time to produce it. Finding highly-talented freelance writers, designers, or video producers can be a huge time-saver for marketers looking to produce quality content on a consistent basis. Yet survey results from our recent study titled “Communication Breakdown: How Marketers and Creatives Can Get Along” reveals these relationships can be just as rocky as they are beneficial. 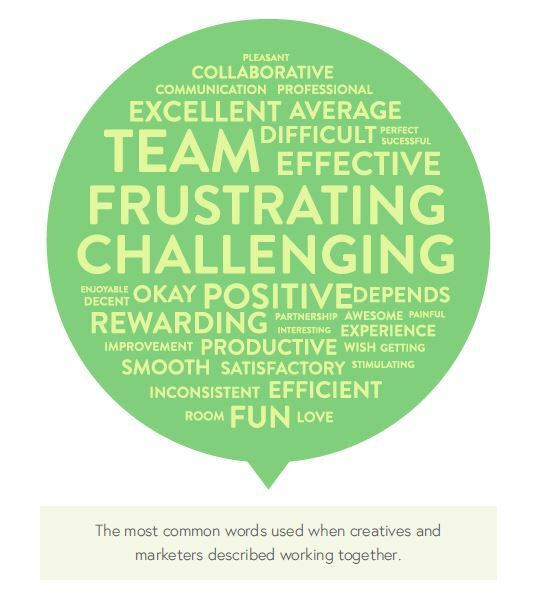 Both marketers and creatives used words like “frustrating” and “challenging” to describe the other, hinting at some underlying problems in communication and planning. Go a step further and you can pinpoint key issues that crop up and drive marketers crazy. According to our survey, less than half (47%) of creatives meet deadline, only a third (36%) follow the creative brief, and just a quarter (27%) anticipate problems during the creative process. Below we examine a few of the issues and crop up between content marketers and freelancers, and propose some quick, actionable tips so you can ensure a consistently great working relationship with your freelancers. Putting in the effort up front will save you valuable time and help you send quality content to the marketplace sooner than later! Timely delivery of content is the glue that holds your projects together. Fail to hit deadlines and you’ll be scrambling to manage multiple projects, not knowing when one will one will arrive on your desk and another will reach completion. The best way to set realistic deadlines is to begin with a creative kickoff. The kickoff is designed to make sure that everyone starts the project on the same page. It’s important to make sure that all of the project’s stakeholders are present during the kickoff to provide feedback, establish roles, discuss potential obstacles, and help set expectations. Laying everything out on the table from the onset will pave the way for a smooth creative process. To stay on-schedule make sure that your creative team isn’t juggling other projects at the time of kickoff. Also, don’t be afraid to check in with your creatives and team members on a regular basis to make sure things are on track. Sure, sending an email or making a quick phone call takes you away from other projects, but it can make or break an assignment! To get the content you expect from creatives don’t be afraid to get specific and detailed in your creative brief. Describe in depth the kind of content you’re expecting, the necessary word count, whether a writer should provide visuals or other supplementary material, and so on. You might find it helpful to request that creatives share an advance copy of their plans with you so you can vet and steer them back to your vision if they begin to drift. For example, ask your writer to provide an outline of the major topics they’ll be touching on in the blog post, or provide them with a working outline that they can build on. A short conversation can avert wasted time for everyone involved in the content creation process. It’s nice to be in control of a situation, but few creative projects hand over the reins entirely. Tell your freelancers that you understand issues can arise during the creative process and that you’re empathetic to that. Nonetheless, your expectation is that any problems will be reported to you ASAP so that you can work out a solution or find a workaround together. 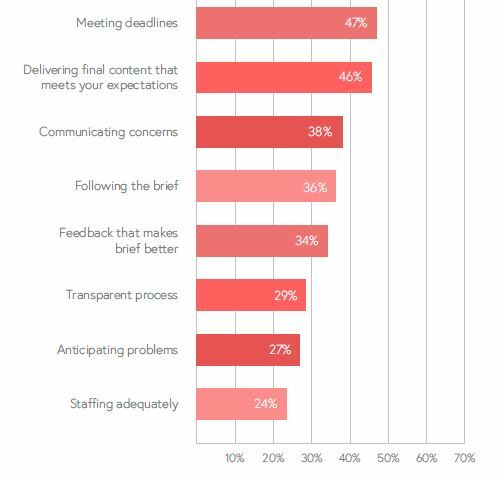 Content managers are understandably frustrated when freelancers fail to report a problem with a project until hours before a deadline. Encourage open lines of communication so you’re kept in the loop in the event of an unforeseen problem, whatever the reason might be. Our survey revealed that only about a third of creatives do an adequate job of following the creative brief for any given project. To turn that statistic around, we recommend you spend time reassessing your creative brief (we recently followed our own advice and introduced a new creative brief here at Visually). Our new brief clearly outlines the objective, creative inspiration, audience, existing materials, and project management. When building your own creative brief you may add or remove these categories depending on what makes sense for your content. The purpose here is to establish a vision for your project, provide the assets needed to bring the project to fruition, and explaining your targeted audience. Outline the project from end to end, minimizing the risk of misinterpretation and off-target results. You don’t hire creatives to serve as ‘yes men’ and ‘yes women’. If you want a piece of content to be great, you should actively seek your creatives’ thoughts on a project before you get started. Prior to the kickoff meeting, ensure all parties have been given time to view and process the creative brief. Each stakeholder should be asked to provide actionable feedback on ways the brief can be improved, or to ask questions that clarify any misunderstandings. If a creative can’t share an opinion on a particular project and its direction, you might want to find someone who demonstrates more investment in the content. Feedback will also help you develop better and more robust creative briefs in the future, and will ultimately help you develop a more efficient content creation process! Every content marketing team works differently and has their own set of processes for creating, approving, and publishing content. To keep things clear and efficient, it’s best to be transparent and give your freelancers a sense of your process. First, you’ll create a draft for my team to review and suggest edits. We’ll aim to give you a copy of our edits within 48 hours of submission. Second, you’ll respond to any questions we have by updating your copy and providing a new version, again with a window of two days for turnaround. Third, our marketing team will load your content into the appropriate platform (e.g. blog, social media channel, website, ebook) and prepare it for delivery. Fourth, after publication we’ll circle back to get your feedback on the project and ways we might improve on our processes the next time. We’ll also talk about the next piece of content on which we need your help. This quick step will keep everyone on the same page and help you stick to your timeline. Despite our best efforts, sometimes life just gets in the way. Whether it’s the ubiquitous writer’s block or an unexpected emergency surgery, problems arise from time-to-time. Understanding how to navigate the ups and downs of content creation can be challenging for freelancers. As a content manager, you can help keep a project moving by keeping the lines of communication open and flowing. In email, phone, and videoconferencing communication, always state (aloud) that creatives can come to you at any point with questions or concerns. In the event that an issue crops up during a project, encourage your creatives to troubleshoot. If more time is needed for research, help provide direction by asking them to define how much extra time is needed and where they’ll look to find the information they need. Asking for specific details will help your freelancers refocus and shed at least some of the anxiety they might feel when issues arise as a deadline approaches. If you’re working with a team of freelancers from different disciplines, make sure that you use the kickoff process to quickly identify any talent gaps. For example, when producing an infographic with a copywriter and a designer, you might discover that the copywriter needs help with the research component of the project. Nurture a positive relationship with freelancers and keep the lines of communication open so you can identify talent gaps from the get-go. Spotting this early means you’ll run into fewer problems during the creative process, receive quality content, remain in line with your brand objectives, and meet your deadlines. Nate Birt is a multimedia journalist, social media enthusiast and copy editor with experience at a variety of print and digital publications, and a Contributing Editor to the Visual.ly Blog. Follow him on Twitter at @natebirt.